Westchester Library System Blogs » Gifts for the Foodie with a Library Card! Home > Articles	> Gifts for the Foodie with a Library Card! Gifts for the Foodie with a Library Card! The best decision I ever made was to marry a man who loves to cook. Not surprisingly, I’d say the second best decision may have been to take up running. Aside from amazing tomato sauce he makes some of the best bread. When that is matched with a flavorful olive oil – it’s matrimonial heaven. I’ve decided to share that joy this holiday season; he’s making the bread and I did the “hard” work of buying the olive oil. My go-to place is Pure Mountain located at 11 North Broadway in Tarrytown. In addition to being able to sample their flavorful oils, they have amazing balsamic vinegars that make a feast of anything from meats to salads, pears to poundcake. 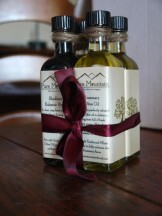 Need an amazing Christmas gift – try the basil infused olive oil and the lemon balsamic vinegar, which together make a salad an event. Or nab a small bottle of chocolate balsamic vinegar and pack it with a homemade pound cake. Or make up a few loaves of bread using my husband’s latest favorite recipe (thank you New York Times) no-kneed, 18 hour ciabatta-type bread (which has as it’s base this amazing New York times sourced recipe); bag each loaf with a nicely-wrapped bottle of peppery olive oil. Library Lovers Alert: Pure Mountain says they’ll give 10 percent off to anyone who shows their library card at check out. How to Gift Wrap your Holiday Gift And the librarian recommends… Quiet!